Latest Design Option 4-1, Peninsula Bar » Roger Perron Inc. Here we have a remodeled kitchen with seating at the peninsula bar. The walls of the kitchen dividing the living room and dining room were removed to have an open-floor-plan, great-room result. The tile floor of the kitchen makes for ease of cleaning and provides a beautiful transition from the hardwood flooring; notice the granite sill dividing the floor materials. 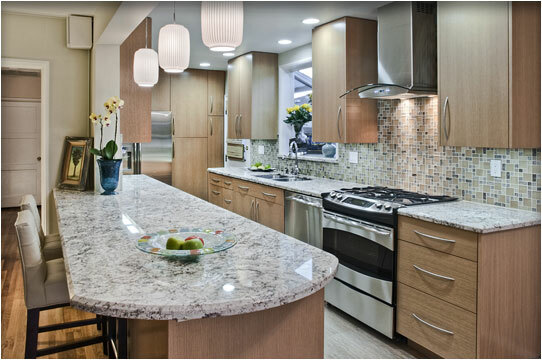 Design for this kitchen remodel and new open floor plan in Redondo Beach was created by Roger Perron, design-build general contractor.